The Right Form Builder- Building Web Forms in Just the Way You Like It, Without Subscription! The right tool to build, download, then host forms on your own website, and done! No subscription, no limitation! Just the way you like it. A form designer helps you create ready-to-use professional, beautiful, and mobile-friendly web forms. Within minutes, you will have a fully functional web form that runs on your website; featuring field validations, email/sms notification to receiver and sender, picture choice, image/video, file upload, address autocomplete, multi-step, payments, conditional form logic, signature, SEO, google analytics, server side validation, field masking, reCaptcha, and localization. Each form has an admin panel to edit, view, and download form data in spreadsheet format. New option "Save data to database", read how-to here. Great form usability experience by using client side validators. There are more than 12 validators, including email address, number, date, url, credit card, equalTo, phone number, pattern validators and more. Server side required field validation also gives you a second protection to make sure you have the data you want. Increase form completion by splitting your forms in two or three steps. Create smart web forms with Conditional Logic to show, hide, disable, enable or jump to a field. The Form Logic is a smart way to hide the complexity of your form. It's a great way to achieve better user experience, and leaves a good branding impression to your website visitors. Selling services or goods in a form with PayPal Standard, PayPal Braintree, or Stripe payment gateways. Include images to single choice (radio buttons), multiple choice (checkboxes), and dropdown fields to make your form more appealing and fun to use. File upload fields allow you to upload multiple files with type and size configurations and send it as email attachments or as download links. When a user sends a form submission, you have options to be notified by email or by phone text message. If you want to, you can also send a email/sms notification to form sender too. A must have feature for web forms with address fields, especially on mobile forms! Passing URL variables to a form will automatically set values to fields when form loaded. Decorate input fields with text and icons, we all want our forms to be beautiful and professional. Design your own mask patterns to ensure you collecting the correct formatted data. Masking will give clear instructions and joys to your users while filling out your form. Make your Date fun with options that set date format, week start, start date, end date, and disabled date, will help your users to pick the right date. 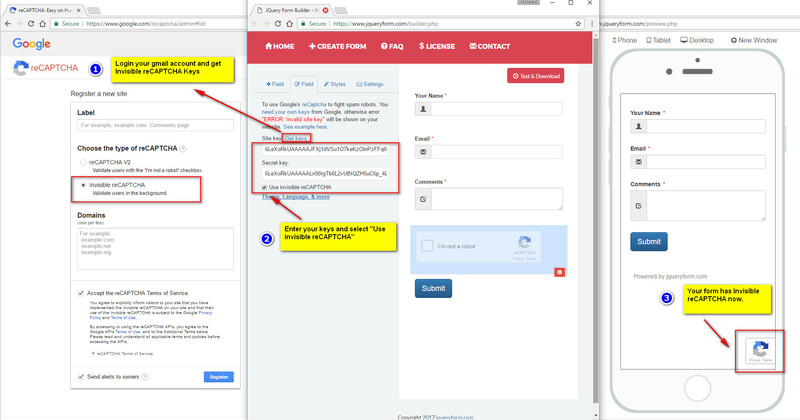 Protect your form with Google reCaptcha service, to stop spammers and bots from sending you spam; Define SEO friendly meta tags, and integrate Google Analytics tracking code right into your form. Use predefined variables and user input values to create email messages for your clients, or send personal touch auto-response email messages for form users. Each form has an admin panel to edit form, check email traffic log, view and download form data in spreadsheet format. Multiple admin users supported. Once you download all the form files, you can host them and collect data on your own website. You are welcome to change your forms for your business needs. After your forms run on your website, they have ZERO dependency from the form builder website, no expiry date or limited features whatsoever. You have full control of your forms.